Back in Delhi from Amritsar, Gayathri is very ill with vomiting. In fact, Nandan and Joshina also fell ill. We were very worried but two days of own care, pulled everyone back. After a forced two day sit in at the hotel, we moved on. Family is back on their feet by the second day. Delhi metro trip to Faridabad. Dinner at Sharavana Bhavan – Connaught place and the shocking taxi bill. It was after 12 AM by the time we exited from IGI Airport. Once we were out, Gayathri started vomiting right outside the pre-paid taxi counter. Suddenly, we had a difficult situation at hand. 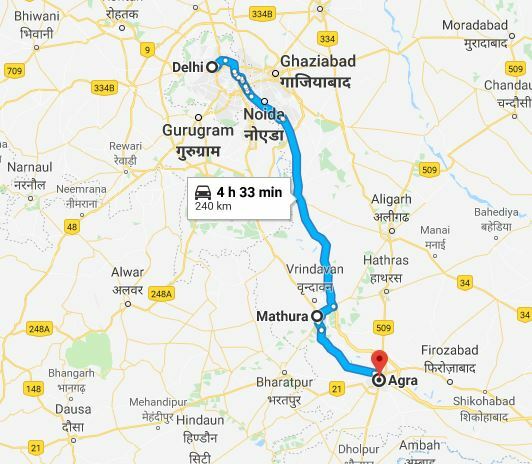 As per the plan we were to go to Agra next day and proceed to Udaipur from Agra by Train in the evening. The sudden turn of events as she continued to vomit and sicker by the hour, started to turn the matters. Trip to the Udaipur was very special to me as I have never traveled to that part of Rajasthan before. I was thrilled about seeing the city of lakes and Romance. Once you are outside the terminal building, the CISF wouldn’t let us in although the constable at the IGI entrance was witnessing her condition first hand. Hence, we had to depend on a comfort station facility that was bit away from where we were just outside the IGI entrance when her problem started. Gayathri earned the unique distinction of having vomited just outside the security stand at the IGI international airport entrance. The CISF officer while denying us entry back into the terminal building to approach a wash room and find a resting place for Gayathri, could have been seen calling his commander over wireless after her utterly demotivating display of respect for the airport security at the Indian capital’s prestigious airport. I strongly suspect the late-night dinner we had at the Amritsar hotel (ordered from somewhere outside) didn’t go well with the digestive system and started the poor health Gayathri started facing. These days I try to skip at least one meal as I believe eating less and maintaining body weight mainly by skipping dinner in order to control the intake, will go a long way in keeping one healthy. Her condition continues to worsen as we reached hotel Delhi Darbar in Karol Bagh. During the night, she continued to be sick and we were obviously worried about what would happen. But with an issue we had mainly suspected on food, abstaining from food and reducing to black tea and boiled rice were the immediate action plan. During the next day, were supposed to head for Agra to see Taj Mahal and then onto Udaipur by Train by evening from Agra but the plan was abandoned. During the day, Nandan and Joshina also started to get sick and vomited. But somehow situation remained under control. By the night, things got better and on the day after, we remained at the hotel Delhi Darbar though that day was supposed to be spent at Udaipur. Two days were lost from our precious great Indian Family tour. Also, the money spent on travel bookings to Udaipur, hotel booking was also lost. These two days, I was in touch with the driver who first took us to Delhi destinations. His name was Ranjith. He was offering to take us to Mathura and Agra. The instinctive trust that I mentioned one needs to develop during such solo travels (without the aid of a package tour) is mainly towards people such as drivers whom we trust with our belongings as we proceed go to a restaurant, a wash room, or a monument during the travels leaving the belonging in the vehicle. To our luck and the right instinct, Ranjith was a fine man. On the second day night, I have tentatively arranged with him that he pick us up in the morning to go to Agra on the next day at 9 AM. By the second day afternoon, things got under control with the own treatment of boiled rice, black tea, glucose, a pharmacy bought tablet for vomiting that some of us ate, we were back to our feat. While I was utterly dismayed by the fact the Udaipur trip that was close to my heart had to be dropped, I was relieved we dealt with a potentially devastating medical situation with common home remedy and that family had recovered for possible onward travel. Delhi metro is India’s crown jewel in public transportation improvements. It is India’s largest and very well-maintained metro network. We wanted to travel in the metro as one of the tours objectives. To go to Faridabad where we had a cousin, we boarded the train by paying for one-time travel and the experience was great. We travelled from Mandi house to Escorts Mujesar metro station to be able to reach our relatives. We fund that the metro is being actively used by thousands of people and that the whole experience is great in a city where the only available public transport earlier was bus. Taj Mahal is the ultimate monument in India and probably the world over. A visit to Taj Mahal is mandatory for a serious traveler to Indian tourist destinations. Delhi is gateway to not only Taj Mahal but to most of North India’s most important tourist destinations. There is no travel destination as majestic as Taj mahal in the whole of India. The first time I visited Taj Mahal built by Mogul emperor Shajahan was in 1989 when I was undergoing training at Hindustan Computer Limited’s Dehradun reprographics division facility for Microcomputers training. We, three friends travelled to Taj Mahal from Dehradun through Delhi to spend one weekend. We reached Agra and proceeded to Taj mahal at around 7 PM and we saw the monument when the moon was shining. The security outside the Taj Mahal has been always tight and we were denied entry as the time elapsed and there is no entry in the night. Taj mahal is known to be exceptionally more beautiful in the moon light. Seeing how beautiful and dreamlike it looked in the moon light we decided to take a hotel and stay back as young trainees we were not so sure whether it is ok to spend night there having to return to Dehradun on time. My second visit to Taj mahal was for our Honeymoon, Joshina was of course stunned by its beauty, I remember. For me this was the third visit, for Joshina, the second, and for Gayathri & Nandan, the first. On the 7th day of our tour, we set out for our Delhi Mathura Agra Delhi day trip at around 9 AM from Delhi Darbar hotel in Carol Bagh area. We had to return to Delhi not so late as we were not going back to the Hotel once we are back but heading to the Delhi railway station for the next leg of our epic North India Family Tour. As you can see in the Google map below, a trip to Agra could be combined with a trip to Mathura as most tourists do. But I later realized hiring a car was a mistake due to its exorbitant cost. Even with a car, it took a substantial time to reach Mathura as road was not so great. After reaching Mathura, our main plan was to visit the Sri Krishna Janma Bhoomi temple which is also the main destination of any tour to Mathura. On the way to the Sri Krishna Janma Bhoomi temple, we also visited the ISKCON temple. 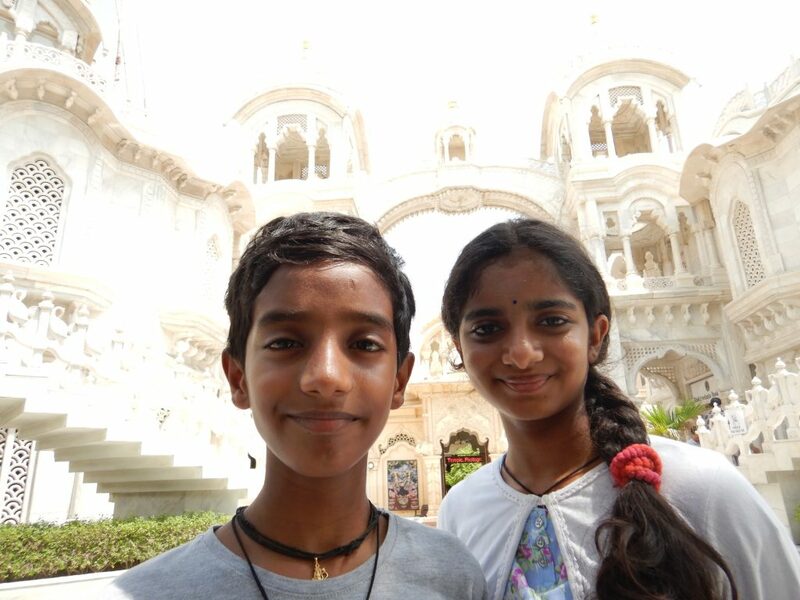 As Gayathri and Nandan was attending the Bhagavat Geeta classes, the visit to the ISKCON temple was especially important to them. Mathura’s streets are not so neat as a tourist is likely to expect. This was my third visit to Mathura. However, the traffic the chaos on the streets wear you down a little bit. ISKCON temple in Mathura, Vrindavan area was a magnificent place of worship. The architecture and the grandeur in several ISKCON temples in other parts of India is also great. After praying at the ISKCON and spending around an hour at the premises, we moved onto the main Sri Krishna Janma Bhoomi temple that we wanted to visit. However, as we reached the site, the temple was closed and we could not visit it with a very tight plan and the need to reach Delhi by the night. Some of the people there close to the temple premises then led us to Radha Rani temple which was quite far from the main temples spot. ON hindsight, I know think the trip to Mathura could have been better planned as we spent a lot of time there without a very fruitful visit. We spent around two hours in Mathura before moving onto Agra where we reached after another one hour by around 2 PM. At Agra, we have directly gone to see the Taj Mahal. One of the mistakes that happened there was hiring a guide. Guides are plenty in the Taj Mahal premises. Use their services only if there are qualified guides offering services. Some of them lack good guidance skills making their accompaniment more irritating than providing some meaningful guidance. Taj Mahal, one of the wonders of the world, never ceases to amaze! On my third visit there, I felt that the monument stood as opulent as it ever was. Some work was going on in one of the minarets. Crowd was as always large. You need to provide some type of identity such as passport to obtain the ticket. The security frisking is very detailed and as in the Wagah border security, hardly anything is allowed inside. Hence take care to leave most of the personal belongings away before your planned entry. Our guide helped us with the ticket and formalities as men and women form separate queues for security check before the entry. Once you enter the Taj, you walk through its front garden with pathways on both sides and then go up to the main structure where the tomb of Mughal emperor Shah Jahan and wife Mumtaz Mahal lay. “The Taj Mahal complex is believed to have been completed in its entirety in 1653 at a cost estimated at the time to be around 32 million rupees, which in 2015 would be approximately 52.8 billion rupees (U.S. $827 million). The construction project employed some 20,000 artisans under the guidance of a board of architects led by the court architect to the emperor, Ustad Ahmad Lahauri.” -Wikipedia. How such a structure was completed so long back and with miraculous perfection and artistic beauty will remain a mystery. You will need at least three hours to go around the complex properly and in moderate detail. 7-8 million visitors are known to visit the Taj, in a year. You need to visit it to see the beauty and it is hard to explain it in words. First time, most are stunned to see how magnificent the Taj looks. Some paintings, flowers mcared in marble, archways, and other decoration must be seen and cannot be described sufficiently in words, at least with my poor knowledge on the subject. “Agra Fort is a historical fort in the city of Agra in India. It was the main residence of the emperors of the Mughal Dynasty until 1638, when the capital was shifted from Agra to Delhi. Before capture by the British, the last Indian rulers to have occupied it were the Marathas” – Wikipedia. As you can see in India above description, Agra fort is the second major attraction in Agra. It is a massive fort where Mughal emperors once lived. 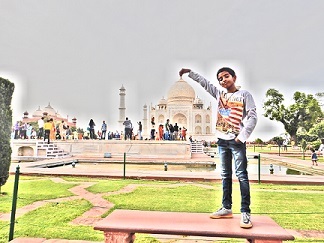 It is short travel from Taj Mahal complex. We were tired by the evening and the Agra fort became our resting place. By now, it was 3 or 4 PM in the evening. Since we needed to reach Delhi for further travel, we have quickly gone through the fort. The temperature came down a bit by now and it was making our movement little bit comfortable. As you need to see these massive complexes through walk, I would like to remind you again to choose winter months for your travels in North India. What you are likely to witness in Agra Fort is the same type of complex and spectacular looking structures that was constructed without any modern engineering or logistics support, centuries before. These sites of Indian history must be visited with time at your side. At least two days must be allocated to each location to clearly understand, explore, ask questions to knowledgeable others and to build the right background about historical monuments. Mughals ruling of India that extended to centuries is assessed with accolades and criticism at the same time by the Indians. But I don’t think anyone can question the greatness of the fine architecture, great palaces, forts, and other such structures that they left behind for the posterity to be in awe. Agra fort is a large fort. You need to plan to spend at least two – three hours to properly walk around and see the fort. At around 4 PM or so, we left Agra for Delhi through the Yamuna express way. The climate was good, and the road was relatively empty after entering the Yamuna express way. Due to the days hectic tour Joshina and Gayathri went to sleep for most of the travel. However, I kept watching the Uttar Pradesh states country side pass by while also talking to driver Ranjith in my not so perfected Hindi, while on the Yamuna express way. After about two hours of travel in the Yamuna express way, we entered the Noida area and the traffic became very high by then. After travelling about twenty minutes, it was around 7 PM in the night and we had to catch a 11:50 PM Train, Nanda devi Exp (12205) to Haridwar for the next leg of our journey. At this time while in the Noida area express way, the car was a bit wobbly while on heavy traffic on a four-lane road approximately twenty minutes travel away from Delhi Connaught place where New Delhi Railway station was close by. Driver quickly but with great difficulty stopped the car in a small area at the middle of the road at the beginning of a dividing lane. The place was not meant for parking but could be used in an emergency. Ranjith realized that one tyre was punctured. We were lucky that no untoward incident happened and managed to park the car despite heavy traffic. But the problem was, all of us had to get off the car to a place there was hardly place to stand and traffic was moving at high speed and very close by. It was a tough time while Ranjith started to work on changing the tyre. We were almost in the middle of a busy road with several lanes of traffic moving past at high speed. It took about 30 minutes and we stood by a bit worried. For Ranjith, changing the tyre change was tough as the traffic was moving very close to where he sat. I used the mobile phone to give him some more light while at work. Finally, overcoming another great potential danger, the tyre changed, we moved on to Delhi. At around 8 PM we were in Sharavana bhavan (A south Indian restaurant) in Connaught place for dinner before our next leg of Discover India tour with family started. Many days after we started and after an episode of serious health issues that suspected stemmed from food, the family was going for an onslaught of south Indian food at the famous Shraavana bhavan south Indian restaurant chain. Ranjith, our driver from Haryana, also took the dinner with us. The Thali that most of us ordered came with several accompanying items as usual that was very yummy and much loved by Keralites like us. After the dinner and some cash withdrawal at a Connaught place ATM, we moved to the New Delhi Railway station that was very nearby. At first Ranjith was not ready to pronounce a price for our Delhi-Mathura-Agra-Delhi trip. When he finally did after a lot of insistence, I was the one who was shocked. He was asking for about 14,000 Indian rupees. I was not expecting more than a few thousands. In fact, Ranjith is a very good driver, it was his employer whom he went on phone with asked him to ask us for the amount. May be that was their standard rate as stated by his boss on phone with me. Ultimately, I realized it was my mistake to go to Agra by car without correctly understanding the cost and convenience. I am describing the matter in detail in the article section ‘Money wasted in Agra Trip – remember this advice.’ Separately. We went onto the railway station after paying a lesser amount and saying good bye to Ranjith. We boarded the train and was destined to Haridwar, next.